Declan initially studied Chemistry in Trinity College Dublin and worked for a year within the field before embarking on a career in dentistry. He completed his dental studies in the well regarded and innovative Peninsula Dental School in 2012. 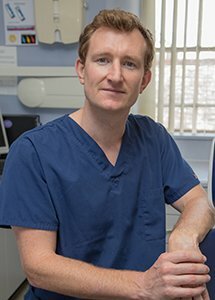 Since then Declan has also been awarded Membership – Joint Dental Faculties in 2015 (MJDF RCS Eng.). After studying in the South-West he was always keen to remain in the area, it’s a lovely place to live with a great quality of life. Declan offers a whole range of general dental disciplines from preventative care, cosmetic fillings, root canal treatment, dentures, crowns and bridgework. Currently, he is looking to specialise further in Implant Dentistry. Declan is studying towards a diploma in Implant dentistry with the prestigious Royal College of Surgeons London. “I take great pride in my dentistry and always try to engage patients in a friendly and approachable manner”.